I just joined a cooking club in DC called "Ladies Who Cook....Sometimes." My guess is that it started because people found that they were too busy to take their cooking seriously, and wanted to set aside some time each month to celebrate fun in the kitchen. Ideally, we'd all get together and cook, but everyone's so busy that the club has taken a potluck format. Each month has a theme, and people make dishes in accordance with that theme. Then we all get together and gorge. Sounds fun, right? Well, this month's theme is finger food. I had originally planned to make brie and onion tartlets, but a last-minute morning walk meant I had less time than I thought I would. 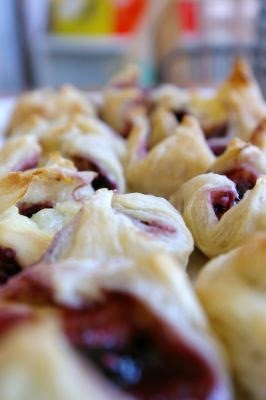 In a pinch, I grabbed frozen Trader Joe's puff pastry out of my freezer (it's sold flat, so it takes a mere 10 minutes to thaw) and made these brie-raspberry bites. They're the perfect appetizer to make in a pinch, and they're sweet without being dessert-y. Working with one pastry sheet at a time, slice into 16 squares. I start by slicing into four equal quarters, then slice each of those into four quarters to make each square the same size. 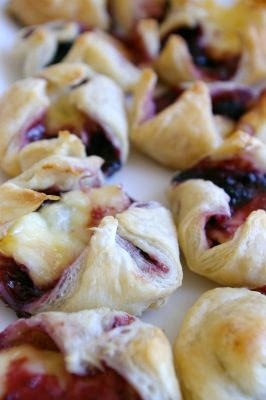 In the center of each square, place 1 piece of brie, 1 raspberry and a dallop of jam. Wet your fingers, and run them along two connecting edges of one of the squares. Fold the far corner onto the near corner, and using two fingers, press the edges together to form a triangle. You may have to really press to make the dough stick to itself, and wetting the dough should help. Wet your fingers, and run them along all four edges of a square. Bring the four corners together, pinch at the center, and pinch along the edges to seal. 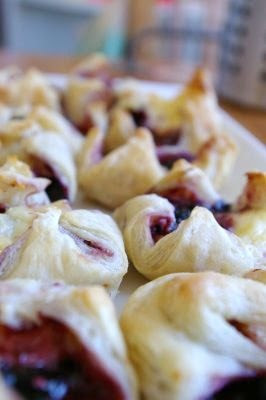 When all turnovers/bundles are created, place them 1/2-inch apart on baking sheets. Bake for 15-18 minutes, or until golden. let cool 5 minutes, then serve warm.